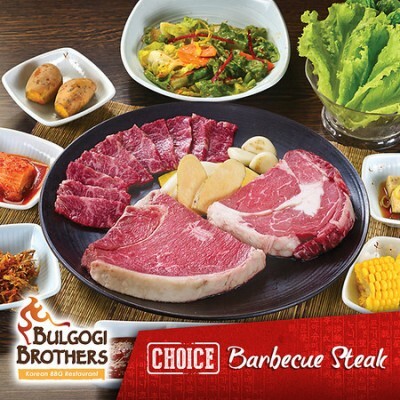 Get ready for a gratifying barbecue steak experience because Bulgogi Brothers is serving up a superb line-up ofUSDA Choice Grade and US imported Angus Beef in its new offerings called Choice Barbecue Steaks. They arethe ultimate meat indulgence for any carnivore with perfectly marbled, prime cuts of beef. A perfect steak gets its robust flavor from how much marbling there is in the meat. At Bulgogi Brothers, customers will immediately know they’re getting the highest quality just by looking at the beautiful contrast of red meat and flecks of white fat that give the steak its marble-like pattern. Because only the finest cuts of beef make it to the restaurant’s Choice Barbecue Steaksmenusuch as the rib eye,and shortrib, which are the most “unexercised” part of the cow and thus contain more marbling than others, expect a truly gastronomical indulgence as each bite is awonderful sensation of texture, tenderness, and intense meaty flavor. Rib Eye & Short Ribs Combo, generous servings of Bulgogi Brothers’ Premium Combination; Rib Eye Steak, hefty slices of fully marbled US rib eye steak. BulgogiBrothers’s signature barbecue steak platters are ideal for sharing with friends and families, but don’t count on it once you’ve had your first bite – the steaks are that delicious! And while you’re at it, give the restaurant’s equally delightful house specialties a try like its selection of Bulgogi dishes, Bibimbap, Spicy Seafood Dumpling, King Galbi Tang, and Kimchi Stew just to name a few. Bulgogi Brothers branches are located at 3/F Greenbelt 5, 3/F Glorietta 2, 2/F South Veranda Mall of Asia, 1st Level Alabang Town Center, and at 2/F Newport Mall.